Ethyl Vanillin, yummy stuff isn't it? What they are selling is their new vanilla extract since war shortages affected the vanilla market quite badly. So what's this extract made of? Ethyl Vanillin and Coumarin, wow they've really been trying to poison us for awhile now! It took me a bit to actually research out what exactly Ethyl Vanillin is because I not much has been done in the way of research on it, but it is a chemical compound which makes it immediately suspect. It turns out that this flavoring is made from Coal Tar where they extract out the benzene component and combine it with other chemicals to make the Ethyl Vanillin.1 Nice, I like my chocolate flavored with benzene and coal tar. I can't really speak to the safety of this compound but it sounds nasty enough to want to steer clear. The other compound in this 1943 war vanilla is coumarin derived from Tonka Beans.2 This is the lovely stuff they put in rat poison nowadays and hospitals use as a blood thinner. It's a safe natural product in very small doses but in vanilla can be fatal if too much is ingested. Coumarin has since been banned by the FDA as a food additive and is most notably present in cheap vanilla produced in Mexico. What does all this tell us? As I've stressed before, read the labels always. If you're unsure about an ingredient it's most likely a non naturally occurring chemical compound that does who knows what to your body. Stick with the natural stuff, it's what nature intended after all. Nice! 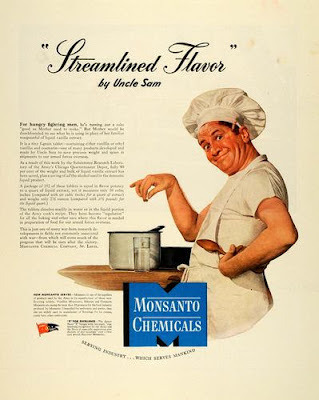 As part of the war efforts, more like "we do chemicals and right now people only do food...let's merge" - ugggg. Great article!